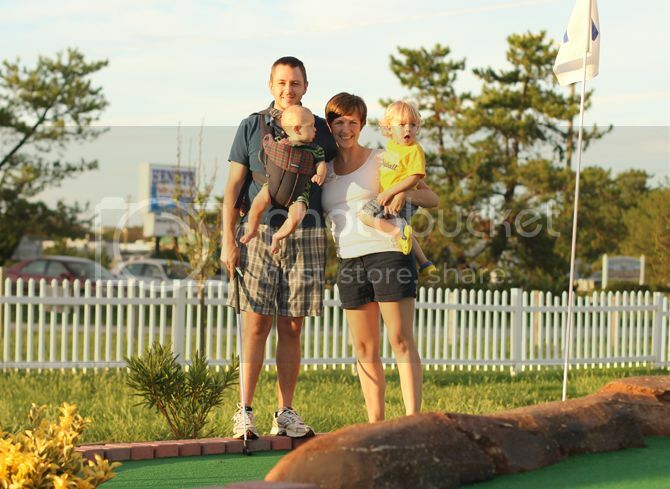 We took Finley (and ourselves and Braden) putt-putting during our Outer Banks vacay. 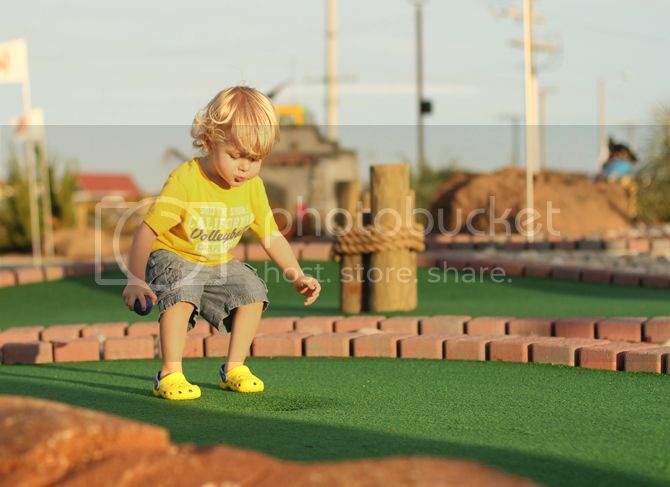 Finley had never been before and it was thoroughly entertaining to watch him try to hit the ball and race around the course exploring and climbing. We were the only ones there (yay off season!) so Finley had free reign (or is it rein? Both make sense...) of the place. I loved it because the light was really really lovely and I got to practice shooting into the sun and having a bit of sun flare. The only difference in these two pictures is where I was standing in relation to Finley and the sun. Sol loved it because he beat me by nine strokes--while wearing Braden. I can only imagine how much he would have beat me by if he was baby free. Such a nice outing for our little family. Even if it's impossible to get the little boys to smile at a camera precariously balanced on a rock... it works. But it works a little better when there is someone jumping and making silly noises behind the camera. 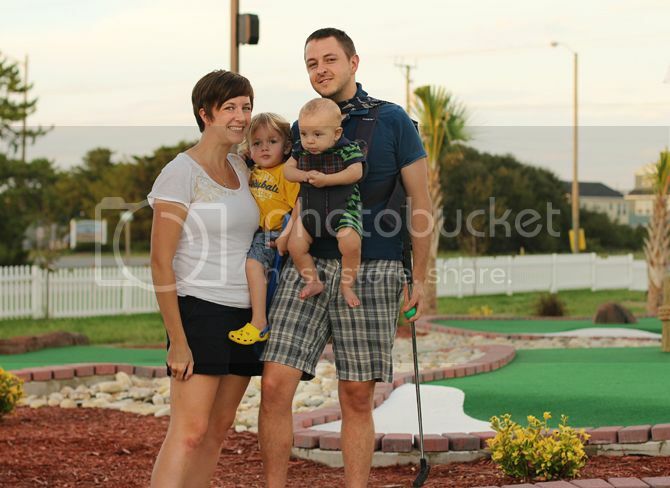 i <3 mini golf. mark and i are going to a real golf tourney this weekend in cali to see some tiger woods guy, but hopefully i can talk him into some mini golf, too! I am usually the person jumping up and down on the other side of the camera when all four of you are in the shot. Cute kids. (Stripes? Yellow? Yes please.) Cute family. And cute photos. Love the lighting! Sounds like a lot of fun and your pictures are beautiful! Looks like a ton of fun!! 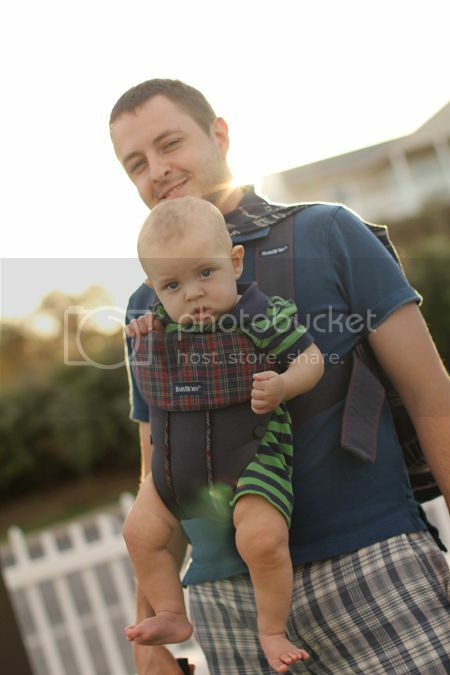 Precious pictures and adorable boys :) Thanks for sharing. love them! 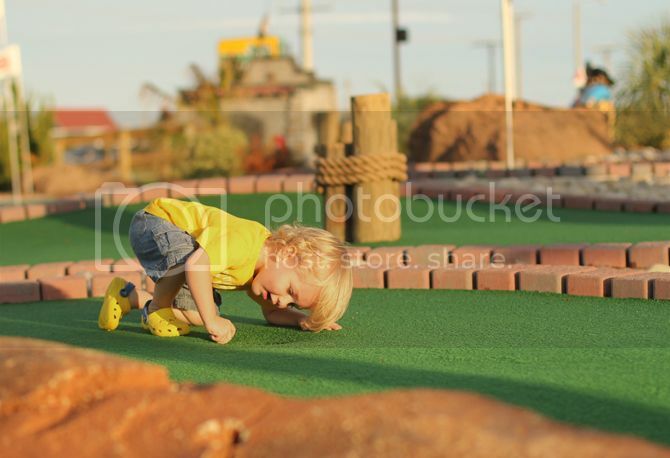 Especially the one where Finley is examining the hole up close! 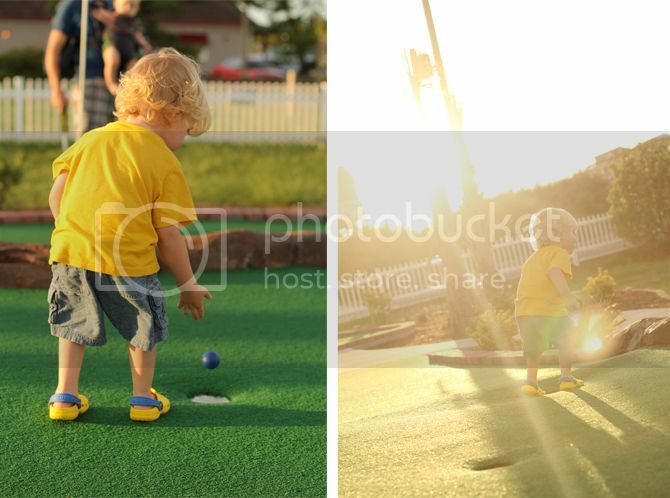 Love that you call it Putt Putt too! Everyone here in NE calls it "mini golf" which is lame.